The recent EAP of IntelliJ IDEA 10.5 introduces a new presentation of Android platform inside a project. Note, that in addition to the Android SDK, you still need a Java SDK because IntelliJ IDEA uses it for compilation. 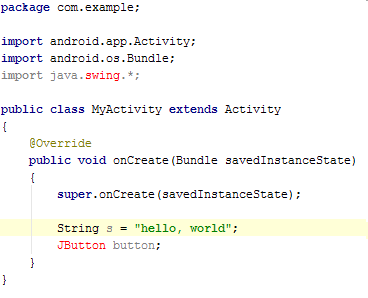 You’ll be prompted for it while creating a new Android SDK. It is important to mention that once you open an existing Android project in IntelliJ IDEA 10.5 it will be converted automatically, no manual configuration needed. You are welcome to try it in the latest IntelliJ IDEA 10.5 EAP build and let us know what you think. This entry was posted in New Features and tagged Android, Mobile, Xena. Bookmark the permalink. Awesome! IntelliJ IDEA becomes better and better for Android development. Thanks a lot. This is AWESOME. No more accidental swing or whatever imports .. should improve performance too. Love it. More specific completion would be nice for GWT as well..
this is how a multi language ide show work, love the consistency emerging here. Trying to create an android sdk by hand. It wants some %!%!% magic file besides the obvious folder choice like “android-10” that I now have to look up somewhere. you don’t need any special files to add an Android SDK simply select your ANDROID_HOME directory when asked where the Android SDK is located. This will allow you to select whatever platforms you want to configure. Thanks, I was very confused about that! Step by step instructions for newbies, with examples, please! My projects are now utterly broken. Continuous Please specify an Android SDK messages on my projects that worked fine until the upgrade. Thanks a lot. The “Please specify an Android SDK” message also appeared for me when upgrading from v10 to v11. I have found a solution though which worked for me. Select File/Project Structure and then select Modules under the Project Settings heading. 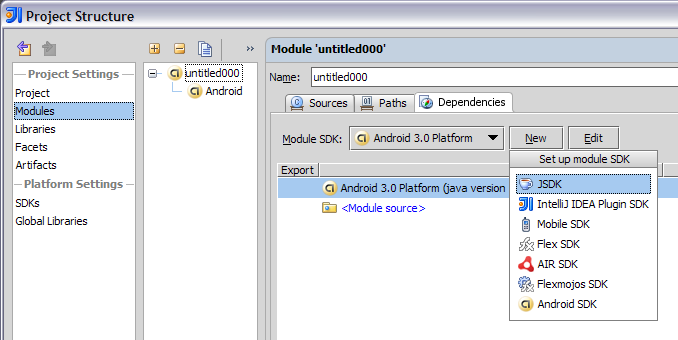 Under the Dependencies tab change the drop down next to Module SDK where it says ‘Project SDK’ or ‘1.6 (java version “1.6.0_20”)’ to ‘Android 2.2 Platform (java version “1.6.0_20”)’ or whatever Java/Android SDK level you have installed. Click OK and the error should disappear! Also found this **incredibly** frustrating. Nothing “automatically” made these changes – I also just got “Please Select SDK” messages preventing me from compiling. I spent several HOURS trying to figure out WTF was going on and only managed to stumble onto this page by accident. I am happy that I won’t be getting any more requests to import Swing Window classes and whatnot – but for chrissake – you could’ve REALLY made this A LOT EASIER. I came over from Eclipse a few months ago, and while I love the features I just don’t get with Eclipse I have to say that I am STILL often confused by IntelliJ’s Project/Module/Facet project structure. It really seems a lot more difficult than it needs to be. Again – my reference point is Eclipse, and in Eclipse selecting SDK’s and such is a trivial matter. so – please take this into consideration – if you’re going to make your own paradigm for your IDE that’s fine, but make it a little more transparent or idiot-proof for the rest of us. oh – and while you’re at it PLEASE fix the ‘dark i-beam cursor on dark background’ issue!! drives me crazy! ok – so now upon relaunching not only is my 10.5 project all screwed up – it no longer works in 10.0 either… seriously – what the bloody hell??!? and don’t hand me – “it’s not a bug, it’s a feature” – I shouldn’t have to spend ANY of my time dealing with this. I have deadlines and they are not being met because you decided to play games with how you implement your SDK’s??!? Thanks a lot! I was stuck on this for over a day because intellij could not find my android sdk!